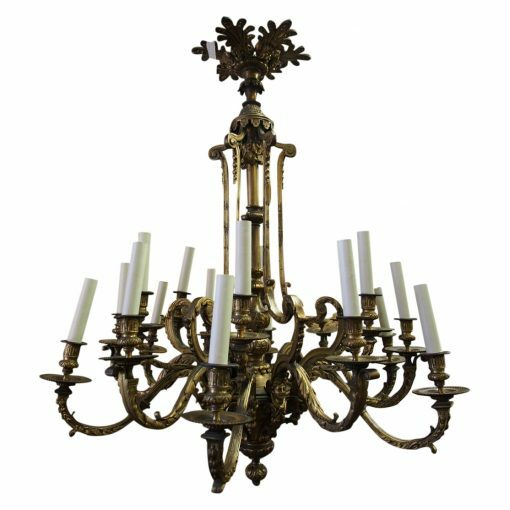 Circa 1880, late Victorian cast brass chandelier. With a ceiling rose that has a design of acanthus leaves and foliate casting, leading on a to brass column with a downward shaped bezel and further foliate casting. There are 6 downward facing arms which have a C scroll at the top, bell drops on the facing and as they continue down they merge into the main body of the chandelier. From this other similar arms continue out, and every 2nd arm is attached to the main body. A design of cast faces and flora alternate on the arms, and it all finishes on a downward facing, decorated cast finial. The lamp has been completely re-wired with 4 candles and is ready to be hung.